Southern Journeys LLC, a worker-owned sewing company, connects skill, craft and cultural practice to basic needs and basic needs to collective resourcefulness and capacity. The members of Southern Journeys represent a long and revered tradition of hard-working, enterprising women, mothers, community leaders and activists. Southern rural Black communities have survived and thrived due not only to their perseverance, but because of internal networks of cooperation and collective action in the face of seemingly insurmountable odds. 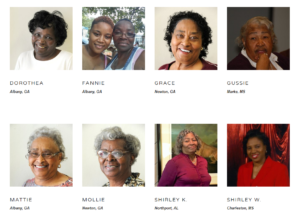 In 2004 the Southern Rural Black Women’s Initiative (SRBWI), a nonprofit collaboration committed to Black women’s leadership and empowerment, asked women in rural communities spanning the Alabama and Georgia Black Belt and Mississippi Delta – If you could improve your lives and your community, what would you need? What would you do? Some of the women attending listening session across 77 counties in the Alabama and Georgia Black Belt and Mississippi Delta responded by expressing their desire to utilize their sewing skills as a means of generating additional income and perpetuating African American quilting and sewing traditions and so Southern Journeys began. SRBWI provided legal and technical expertise to advise the women on creating a worker owned structure. “There is a difference between sewing for yourself and doing a line that has been decided on (by the group),” said Shirley, a Southern Journeys worker-owner whose mother made clothing for her and her seven siblings from flour sacks. “We went through a lot of training just to get our mindset from thinking as home sewers to thinking as a company,” adds Sonya, a worker-owner who served as a machinist in the Navy. In addition to fabrics purchased at a discount in bulk, initial collections were created utilizing up-cycled feed sacks and colorful hand dyed fabric purchased from a women’s collective in Ghana. Consultants worked with the company to explore market and product development ideas that incorporated the goals of cultural preservation and sustainability. In 2010, after organizing and working with staff and technical experts on marketing, sales, product development, business structures, and the intricacies of cooperation, Southern Journeys LLC, a worker-owned cooperative enterprise, was incorporated as a worker-owned company under an LLC structure (see Roland Hall’s recent post for more on this type of legal organization). Today, nine Southern Journeys’ Member Owners and other women who sew on contract, are committed to harvesting the seeds planted. “We have gained not only skills and business revenues at this point, but also a deep commitment to building a sustainable company”; a company that Southern Journeys worker-owner Dorothea envisions will provide “jobs and products for a new generation”. Over the past 10 years Southern Journeys has been propelled by a small and committed team of members who have stuck together, formed meaningful relationships and friendships and remained committed to the big picture in spite of logistical, economic and personal challenges. Without this internal engine of women driving, inspiring and rallying others to join and committed to a long term vision, there would be no Southern Journeys. Additionally, the development of Southern Journeys has depended on core support for organizing, training and technical assistance from the Mary Reynolds Babcock Foundation, the Kellogg Foundation and in the early years, the Ford Foundation, providing women with the opportunities to build technical, practical and relational skills and leadership capacity. The informal economies of rural life, cultures and communities do not receive recognition as social innovations and innovators in a capitalist system that rewards competition and greed. When they do it is usually granted to someone from “the outside” that has come to help. However, within a system that has historically oppressed and isolated communities of color, both socially and economically, it is cooperative networks that have provided a means of meeting basic needs of food and clothing, generating livelihood opportunities, and building community and economic assets. In isolation, small scale cooperative initiatives achieve important goals. But collectively, they represent a larger vision of shared prosperity and cultural and artistic value, not just from the communities that have given birth to them, but to society as a whole. Sarah began at Goddard College in 2008 as faculty for the Sustainable Business and Communities MA and helped to found the MA in Social Innovation and Sustainability. For the past 14 years she has served as the Asset and Finance Development Director for the Southern Rural Black Women’s Initiative for Economic and Social Justice.